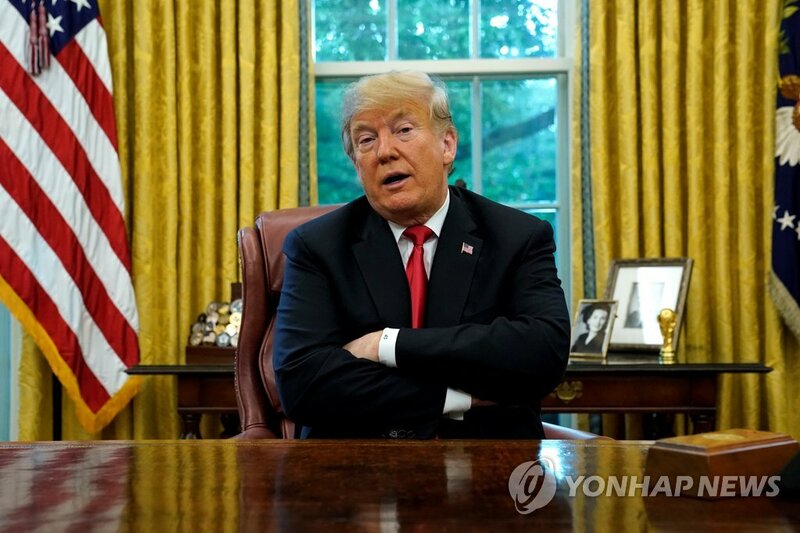 SEOUL, Oct. 11 (Yonhap) -- A controversy has erupted in South Korea over U.S. President Donald Trump's choice of words in a comment regarding South Korea's sanctions on North Korea. "Well, they won't do it without our approval. They do nothing without our approval," he said at the White House on Wednesday (local time), according to a transcript. The reporter was apparently referring to South Korean Foreign Minister Kang Kyung-wha's remarks a day earlier that her government is reviewing whether to lift the bilateral sanctions that were put in place to punish the North for a deadly torpedo attack on a South Korean naval ship in 2010. Nonetheless, Trump's use of the word "approval" raised the eyebrows of Koreans for its negative connotations in country-to-country relations. Formally, South Korea's Ministry of Foreign Affairs was guarded in response. "I think it's not appropriate to comment on President Trump's remarks," the ministry's spokesman, Noh Kyu-duk, said at a press briefing. Speaking privately, however, a ministry official questioned if Trump had been aware of the overall context of Kang's comments. "He seems to have repeated his basic position on sanctions on North Korea," rather than specifically on the May 24 Measures, he said. There's a view, the official added, that the president was also emphasizing the importance of consultations between the allies. Even so, for many people here whose mother language is not English, Trump's use of the word "approval" is controversial. They regarded it being tantamount to "permission," which suggests an unequal relationship. "Approval is more neutral in meaning. Trump probably means something closer to 'agreement' given friendly relations between the two sides, but the U.S. President doesn't always speak precisely," he said. The ministry's spokesman, reaffirmed Seoul's commitment to maintaining sanctions on Pyongyang until there's an "assurance" of its complete denuclearization. "Now that progress is needed in denuclearization in order to ease the sanctions, (we) will closely consult with the U.S. and other relevant countries in accordance with progress in denuclearization," Noh said.